I started this article series trying to explain that XenApp 7.5 and XenDesktop 7.5 are actually the same product and therefore also the same installation and configuration steps apply. After this explanation I described the installation steps of the Delivery Controller. In part one of the article series I installed the Delivery Controller software. As shown in part one you can start Studio for this initial setup directly. When you unchecked that option, you can just use the Studio Console to start the initial set-up. 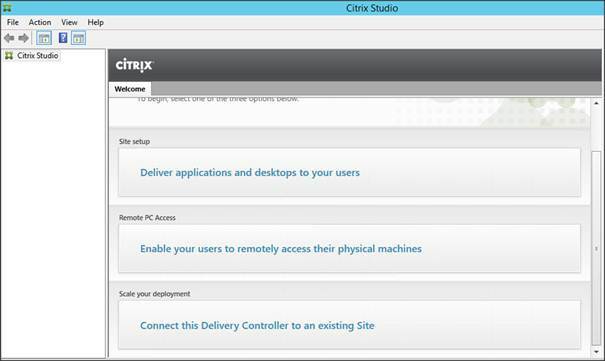 When Studio starts it offers three options: Site Setup, Remote PC Access and Scale your deployment. 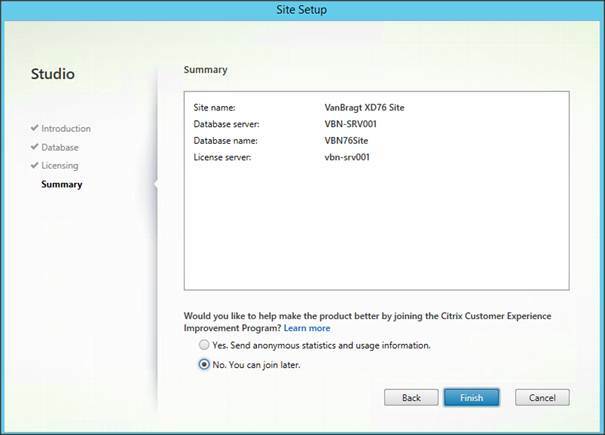 I won’t discuss Remote PC Access in this article series and as this is our first Delivery Controller we need to choose Site Setup by selecting the option Deliver Applications and Desktops to your users. 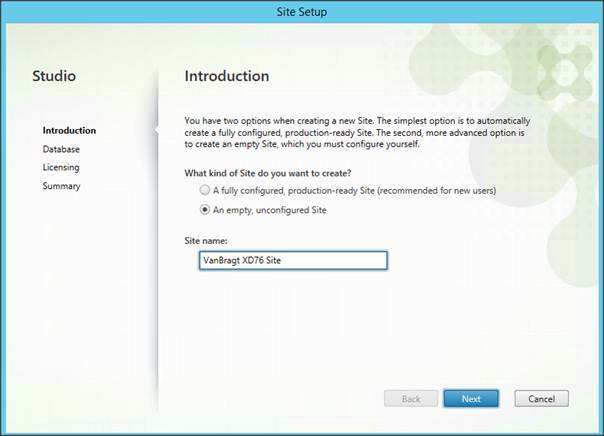 The Site Setup wizard starts by asking you to either create an empty configured Site or to create a fully configured site. For this article I will use an empty, unconfigured site as this makes is easier to explain the configuration out of the console in this article series. The next step is specifying the databaseserver and databasename. As this is the first Delivery Controller, a database will not be available. You can specify a name for the database (the wizard will suggest one based on the Site Name filled in the previous screen). There are two options to create the database, you can continue the wizard or create a database script. 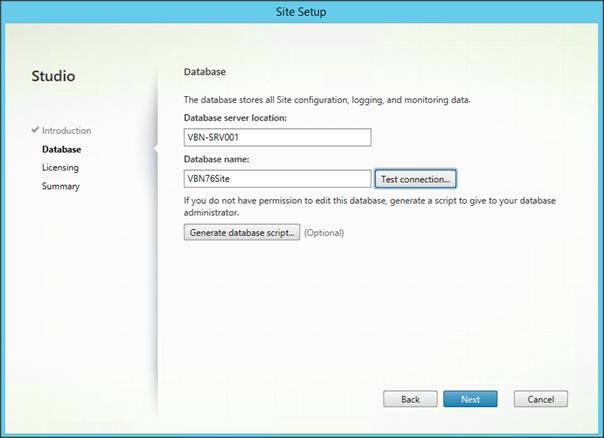 The database script can be used to provide it to the database administrator if you don’t have (enough) rights on the database server to create the database via the installation wizard. I have enough rights, so for this article I will use the option to create the database via the installation wizard. Continue with the wizard. A message will be shown that the database is not available and that via the OK button the database can be created. 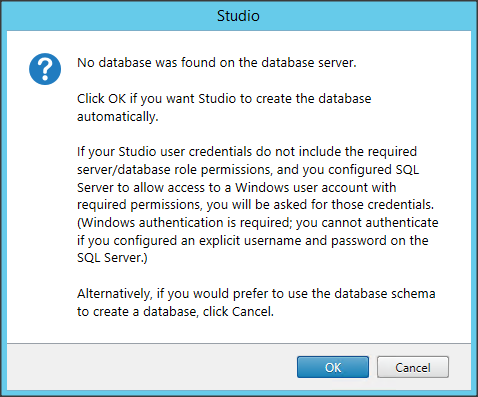 Figure 4: No database was found, create the database automatically? Providing the license information is the next step. If you already have a license server running, you will probably have to update your current license server software with a new version. As shown in part 1 you could have also installed the license server on the same machine. You can also use the 30-day trial (you don’t have to specify a license server at all using this option). 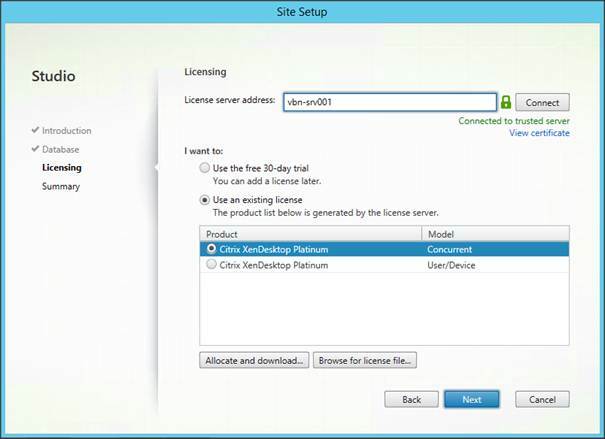 After the licensing information a summary is shown before the actual configuration starts. In this screen Citrix also asks if you don’t mind sending statistics and usage information. During the configuration phase a progress bar is shown. When the progress bar disappears the site is created. In the Studio Console all kind of options are available. We will come back to this part later in this article series. First we will add a second delivery controller. As mentioned in part one, the Delivery Controller is the heart of the XenDesktop infrastructure, so logically you want this component highly available and fault tolerant. This can be done pretty easily; just add one or more Delivery Controllers to the infrastructure. Also for these Delivery Controllers this is done by starting the Studio console. For adding a Delivery Controller to the just created site we need to choose the obvious button: Connect this Delivery Controller to an existing Site. 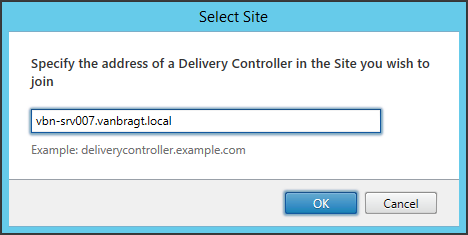 The first step is to specify a Delivery Controller in the site this Delivery Controller should be joining. After the Delivery Controller made a connection with the specified Delivery Controller, Studio asks if you would like to update the database automatically. If you choose No the wizard generates an SQL script, which can be used to add the Delivery Controller information into the database. When you chooses Yes the database will be updated automatically. 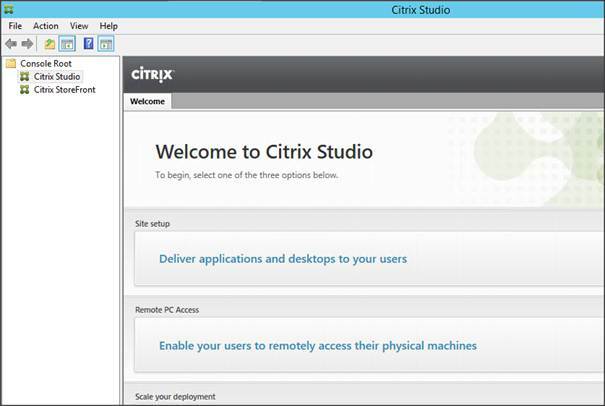 When the database is updated the server is added as a controller within Citrix Studio and also the Studio on the added Delivery Controller will show the site information. Again for now we will leave the Studio console and execute the basic configuration of the StoreFront component, so users can connect to the environment at the end of the article series. 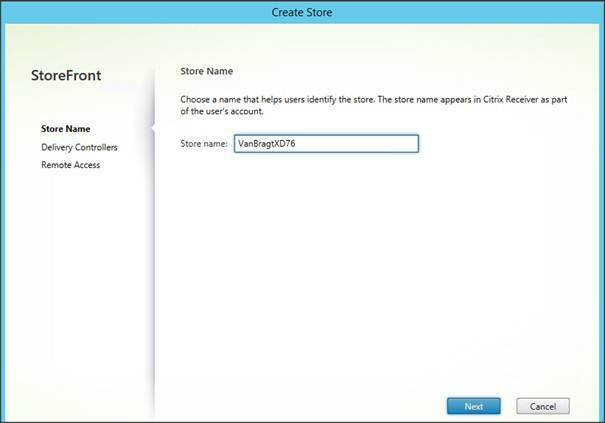 Also to configure the StoreFront component you need to start the corresponding console called Citrix StoreFront. 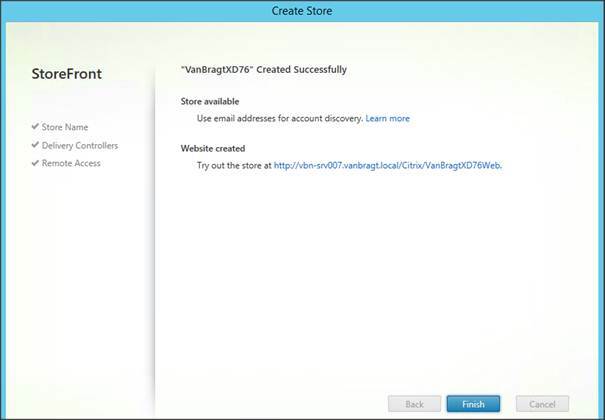 As this is the initial set-up the easiest way to set-up is to use the Create a Store button in the main window. With this button the Create Store wizard will be started. The first step is providing a name for the Store, this name will be shown to the end users and will be part of the URL. 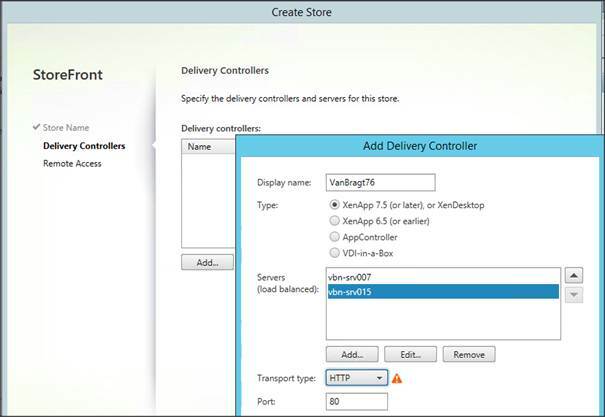 The second step is providing the earlier installed and configured Delivery Controllers. With the StoreFront 2.6 release Citrix finally made it more clear which type you have to choose as StoreFront also supports older XenApp releases. For XenApp/XenDesktop 7.6 you logically need to choose XenApp 7.5 (or later), or XenDesktop. Also remember that the Delivery Controller without additional configuration communicates over HTTP. Finally you need to provide the way StoreFront provides access to the environment. Three options are available below Remote Access: None, No VPN Tunnel and Full VPN Tunnel. You will choose None if you would like to use the StoreFront without a Citrix NetScaler Gateway, in other words the end-user will directly type in the URL of the StoreFront server for example for internal access. 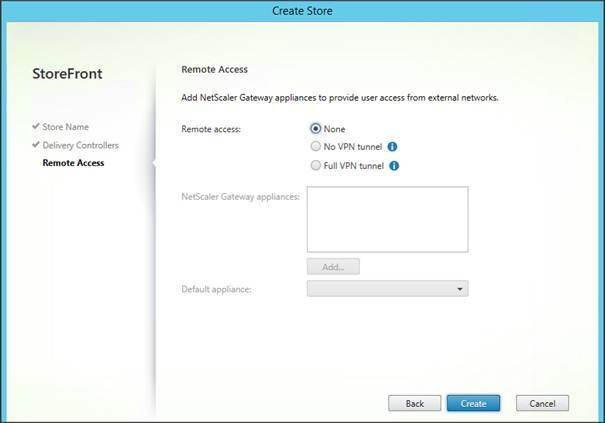 When using the Citrix NetScaler Gateway you will choose between No VPN Tunnel or Full VPN Tunnel, where No VPN Tunnel will be used providing access to the XenDesktop infrastructure only and a Full VPN, as the name applies, will set-up a standard VPN connection tunnel. After pushing the Create button the Store and Corresponding website is created. In the window mentioning the successful creation of these, the URL to be used for WebAccess is also shown. It’s worth mentioning that during the initial set-up of the Delivery Controller, a StoreFront configuration is alsoexecuted. I guess the wizard “noticed” that StoreFront is also installed locally and is automatically configured. So if you install StoreFront on the same server, you don’t have to execute the above shown steps. In the first part of the article series, the installation of the Desktop Delivery Controllers was discussed, in this part we executed the initial setup of the first and following Desktop Delivery Controllers. 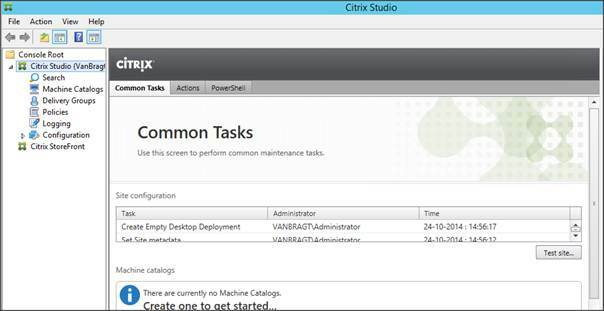 The last topic was the basic configuration of the Citrix StoreFront component, so that at the end of the article series users cannot connect to the XenDesktop infrastructure. In the upcoming part we will continue with the installation of the VDA agent, followed by the creation of a basic XenDesktop environment.